Featured Resource for October - Story: “My Mom Wanted to Abort Me." 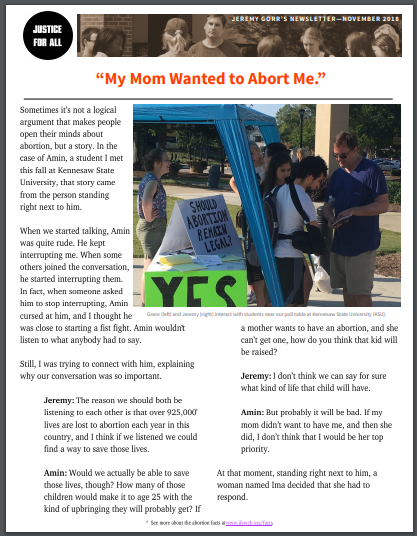 In “My Mom Wanted to Abort Me,” Jeremy Gorr shares a story from our recent outreach event at Kennesaw State University. In the conversation, he saw first-hand how a personal story can help open a person’s mind and heart to change. Take note of Jeremy’s approach to the conversation, asking questions and gently challenging Amin to consider a more optimistic perspective. Note also how God caused Ima to be present at precisely the right time with the courage to speak. We’re reminded that we can train Christians in good conversation skills and good arguments, but ultimately we depend completely on God and his work behind the scenes to change hearts and minds. Older PostFeatured Conversation Starter for October - "Opposite Poles?"